Whoever wrote the rest of Revelation had a very favorable interpretation of the Old Testament and Jewish Christianity and had a lot of ax-grinding against the heretics and the Roman political state. And the author appears to have rejected Paul entirely. The letter to the seven churches that prefaces the actual apocalypse chastises those “who claim to be apostles but are not” and those “who claim to be Jews and are not.” Those were two contested issues about Paul during that era, that is, whether or not he should be considered an apostle and where or not he was actually Jewish. This is some what ironic because the letters of Paul and an apocalypse written by someone who despised him wound up in the same canon of scripture. Even the saying of “the deep things of Satan” of Revelation 2:24 seem to be a direct parody of Paul’s “the deep things of God” per 1 Corinthians 2:10. Of course, Paul was originally the one who taught it was acceptable for Christians to eat meat that had been sacrificed to idols so long as it didn’t offend another Christian. Paul obviously never condoned fornication, but what the author of Revelation may imply by fornication is Gentile influence upon Jewish Christianity, which would again point to Paul, who also may also be referenced as the “false prophet” per Revelation 13. This corruption or “fornication” can also be paralleled with how the Church Father Epiphanius claimed Marcion seduced a young orthodox virgin, which could be read as a metaphor of Marcion’s corruption of the young Christian Church as claimed by Bart Erhman in Lost Christianities. The author of Revelation understood Jesus in light of Jewish Messianism. 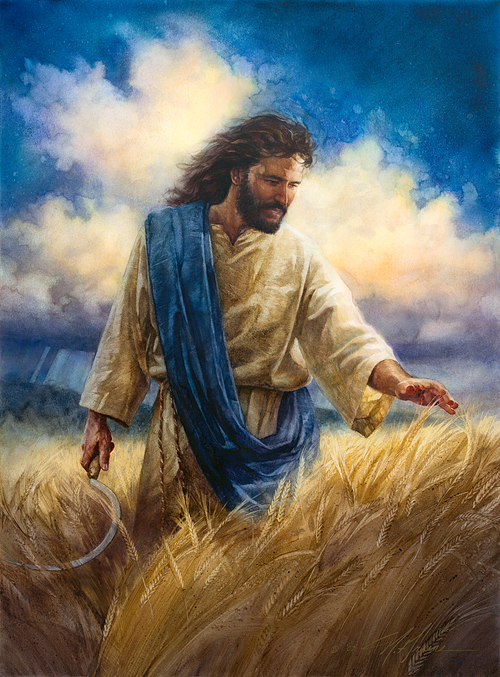 That is, he believed that Jesus, upon his second coming, would fulfill all of the messianic prophecies that he failed to fulfill during his ministry, which included declaring war against the entire world, establish a messianic kingdom and fortify Jewish Christian preeminence over the whole world. Revelation, however, echoes many Gnostic sentiments as well as Egyptian, Babylonian and Zoroastrian concepts and mythology as we will see. 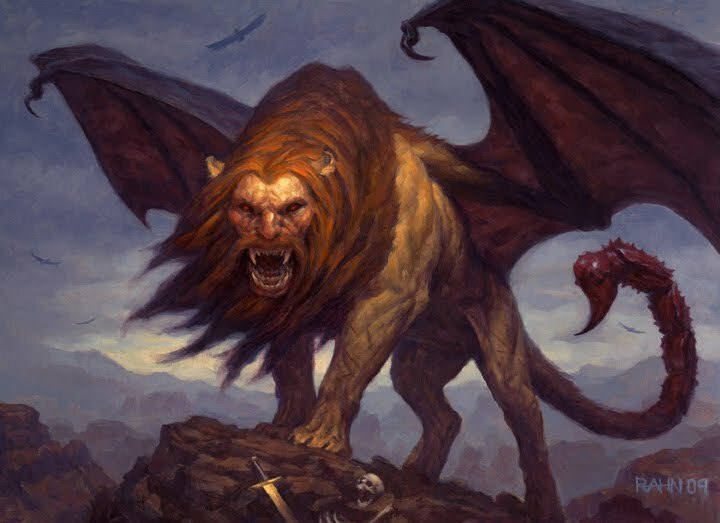 While this is in no way a comprehensive review of Revelation, it is a result of drawing some certain parallels I’ve noticed to other Biblical and non-Biblical mythologies, when going through certain parts of the text. A great sign appeared in heaven: a woman clothed with the sun, with the moon under her feet and a crown of twelve stars on her head.was about to give birth. Then another sign appeared in heaven: an enormous red dragon with seven heads and ten horns and seven crowns on its heads. Its tail swept a third of the stars out of the sky and flung them to the earth. The dragon stood in front of the woman who was about to give birth, so that it might devour her child the moment he was born. The gave birth to a son, a male child, who “will rule all the nations with an iron scepter.” And her child was snatched up to God and to his throne. The woman fled into the wilderness to a place prepared for her by God, where she might be taken care of for 1,260 days. What is striking about this passage is the similarity of the beast’s description with the snake-faced seven-headed dragon archon and anguipede mentioned in the Apocryphon of John, Iao. 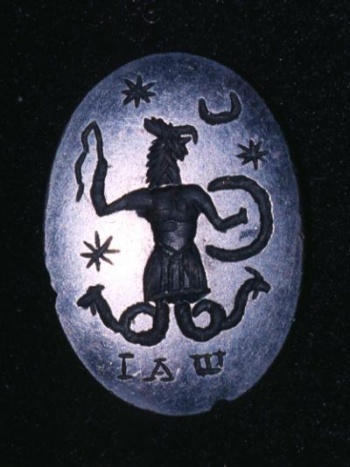 The term Iao is also on many magical amulets, especially with the Basilidean astral god, Abrasax from the the Greco-Roman and the Renaissance periods. James M. Robinson in On the Genre of Mark and John, compares Revelation 12 with the various Kingdoms featured in the Sethian Apocalypse of Adam of the Nag Hammadi Library. In particular, he compared the fourth Kingdom passage with the great dragon pursuing the child of the Mother. The fourth kingdom says of him that he came from a virgin. […] Solomon sought her, he and Phersalo and Sauel and his armies, which had been sent out. Solomon himself sent his army of demons to seek out the virgin. And they did not find the one whom they sought, but the virgin who was given them. It was she whom they fetched. Solomon took her. The virgin became pregnant and gave birth to the child there. She nourished him on a border of the desert. When he had been nourished, he received glory and power from the seed from which he was begotten. And thus he came to the water. In other words, Satan and his angels were active in the lower heavens when they crucified the “Lord of Glory” (e.g. Jesus Christ) in 1 Corinthians 2:8. But in the End of Days, Michael, the archangel and his angels will cast the Devil down to earth. The story of the divine child, who, together with his divine mother, is threatened by an evil power, yet is rescued and finds safety in the wilderness until the evil power is destroyed can very much be interpreted with a Gnostic lens. And naturally, the divine mother and child archetype is one that repeats in almost every ancient culture around the world, beginning with Isis and her son Horus, and possibly before that. The divine Mother, being Sophia, who also gives birth also suggests a connection to Eve, and the divine male child, being Seth, who (with his seed) is caught up to the aeon or put in a holy dwelling place and stays up there for a time, thus overthrowing the powers, i.e. the dragon archon who brought the great flood as mentioned in the Gospel of the Egyptians. And at the end, a voice or Logos, i.e. Seth, announces the arrival of final salvation much like the divine call of Revelation 12: 10-12. 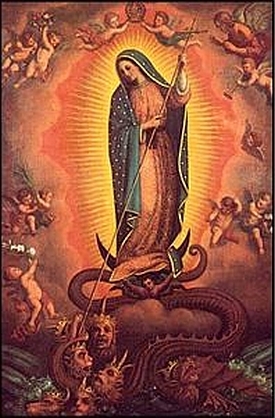 Then from his mouth the serpent spewed water like a river, to overtake the woman and sweep her away with the torrent. But the earth helped the woman by opening its mouth and swallowing the river that the dragon had spewed out of his mouth. And a bird came, took the child who was born, and brought him onto a high mountain. And he was nourished by the bird of heaven. An angel came forth there. He said to him “Arise! God has given glory to you.” He received glory and strength. And thus he came to the water. Another parallel is with the descending dove featured in Mark 1:10 and the apocryphal Gospel of the Hebrews where the child is lifted to Mount Tabor. This entire basic mythological structure between Revelation 12 and the Apocalypse of Adam, can also be applied to the Gospel account in Matthew of Jesus’ birth to Mary and their flight to Egypt from Herod. This pattern can also be seen in certain aspects of the Isis-Osiris-Horus cycle as well as stories of Zeus and his mother Rhea Silvia hiding him from his blood-thirsty father Titan Kronos, Perseus and Danae, and Jason and Diomede. Ancient Greek harpies were also said to be the winged female agents (sometimes depicted with talons) of Zeus that snatched away people who would dare reveal the secrets of the Olympian gods. The idea of a woman with eagle wings also appears in Native American and Aztec legends as the Bird Goddesses, Ix Chel and Itzpapalotl. The symbol of the Eagle was also associated with the soaring spirit over the mundane and base material concerns. It also represented a state of grace achieved through a series of initiations to receive personal, spiritual power through the essence of Shamanic Eagle medicine. There are also strong parallels with Revelation 12 and even the rest of Revelation with the final segment of the Gnostic On the Origin of the World. The woman clothed with the sun is no longer the victimized divine Mother in distress, trying to elude the wrath of the evil powers but is now the one engaged in the pursing against them! The stars of the sky will cancel their circuits. And a great clap of thunder will come out of a great force that is above all the forces of chaos, where the firmament of the woman is situated. Having created the first product, she will put away the wise fire of intelligence and clothe herself with witless wrath. Then she will pursue the gods of chaos, whom she created along with the prime parent. She will cast them down into the abyss. They will be obliterated because of their wickedness. For they will come to be like volcanoes and consume one another until they perish at the hand of the prime parent. When he has destroyed them, he will turn against himself and destroy himself until he ceases to exist. The Simonian text, Concept of Our Great Power also has many strong apocalyptic undertones spread throughout. It even has an Anti-Christ/Beast figure. Then when the times were completed, then wickedness arose mightily even until the final end of the Logos. Then the archon of the western regions arose, and from the East he will perform a work, and he will instruct men in his wickedness. And he wants to nullify all teaching, the words of true wisdom, while loving the lying wisdom. For he attacked the old, wishing to introduce wickedness and to put on dignity. He was incapable, because the defilement of his garments is great. Then he became angry. He appeared and desired to go up and to pass up to that place. Then the appointed time came and drew near. And he changed the commands. Then the time came until the child had grown up. When he had come to his maturity, then the archons sent the imitator to that man in order that they might know our great Power. And they were expecting from him that he would perform for them a sign. And he bore great signs. And he reigned over the whole earth and all those who are under heaven. He placed his throne upon the end of the earth, for “I shall make you god of the world”. He will perform signs and wonders. Then they will turn from me, and they will go astray. So, the archons finally go to war at the end of the “Logos” – “… when the times were completed, then wickedness arose mightily even until the final end of the Logos.” Compare this to Revelation 12:7, when again, Michael wages a war against Satan, who is depicted as a chaos dragon, much like Tiamat of the Mesopotamian religions. And there was war in heaven, Michael and his angels waging war with the dragon. The dragon and his angels waged war, 8 and they were not strong enough, and there was no longer a place found for them in heaven. 9 And the great dragon was thrown down, the serpent of old who is called the devil and Satan, who deceives the whole world; he was thrown down to the earth, and his angels were thrown down with him. Echamoth is one thing and Echmoth, another. Echamoth is Wisdom simply, but Echmoth is the Wisdom of death, which is the one who knows death, which is called “the little Wisdom”. Another curious passage from Revelation 17: 9 tells us that Whore of Babylon sat on seven heads, which could be a reference to the seven rulers who rule over the seven heavens that is listed in the Apocryphon of John. And here is the mind which hath wisdom. The seven heads are seven mountains, on which the woman sat. ‘Come out of her, my people,’ so that you will not share in her sins, so that you will not receive any of her plagues; for her sins are piled up to heaven, and God has remembered her crimes. Give back to her as she has given; pay her back double for what she has done. Pour her a double portion from her own cup. Give her as much torment and grief as the glory and luxury she gave herself. In her heart she boasts, ‘I sit enthroned as queen. I am not a widow; I will never mourn.’ Therefore in one day her plagues will overtake her: death, mourning and famine. She will be consumed by fire, for mighty is the Lord God who judges her. Here also is introduced a symbolic figure, termed “the harlot of Babylon, “which is described as a woman seated upon a scarlet-colored beast having seven heads and ten horns. The woman was arrayed in purple and scarlet and bedecked with gold, precious st Here also is introduced a symbolic figure, termed “the harlot of Babylon, “which is described as a woman seated upon a scarlet-colored beast having seven heads and ten horns. The woman was arrayed in purple and scones, and pearls, having in her hand a golden cup full of abominations. This figure may be an effort (probably interpolated) to vilify Cybele, or Artemis, the Great Mother goddess of antiquity. Because the pagans venerated the Mater Deorum through symbols appropriate to the feminine generative principle they were accused by the early Christians of worshiping a courtesan. 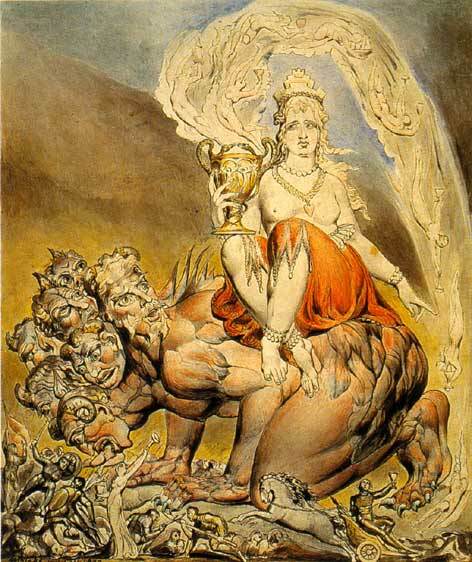 As nearly all the ancient Mysteries included a test of the neophyte’s moral character, the temptress (the animal soul) is here portrayed as a pagan goddess. 14 Then I looked, and behold, a white cloud, and on the cloud sat One like the Son of Man, having on His head a golden crown, and in His hand a sharp sickle.15 And another angel came out of the temple, crying with a loud voice to Him who sat on the cloud, “Thrust in Your sickle and reap, for the time has come for You to reap, for the harvest of the earth is ripe.” 16 So He who sat on the cloud thrust in His sickle on the earth, and the earth was reaped. Behind the Roman Saturn is the Greek Kronos, naturally. And behind those two is the Phoenician El, a name familiar with and associated with YHWH, the god of Israel. The “Son of Man” or Jesus Christ takes on this role of the reaper of souls at the apocalypse. This Son of Man figure also appears much earlier in the Book of 1 Enoch as well. The rest of Revelation also owes a lot of its inspiration from Enochian literature as well. An entire dissertation could be done on this subject alone! The appearance of the locusts was like horses prepared for battle; and on their heads appeared to be crowns like gold, and their faces were like the faces of men. They had hair like the hair of women, and their teeth were like the teeth of lions. They had breastplates like breastplates of iron; and the sound of their wings was like the sound of chariots, of many horses rushing to battle. They have tails like scorpions, and stings; and in their tails is their power to hurt men for five months. They have as king over them, the angel of the abyss; his name in Hebrew is Abaddon, and in the Greek he has the name Apollyon. 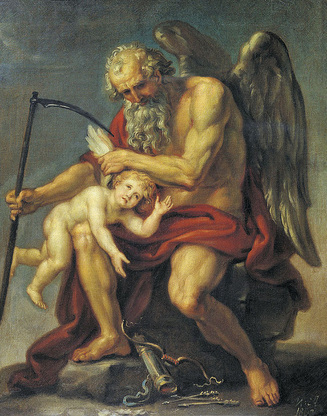 It’s rather interesting that the Revelation author would choose to make Kronos be the good guy (through the Son of Man) while invert the beauty, order and goodness of Apollo into an angel of the bottomless pit. Though Apollo was known as a god of prophecy, law and purification, in his earliest accounts, he could place plagues on mankind as well as cure them. This occurs in Homer’s IIliad, when Apollo creates a nine-day deadly plague on the Achaean army and their cattle. The origins of this reflex of the myth are extremely ancient. An Ugaritic text (CTA 5.1.1-5) alludes to a battle in which the god Baal defeated LTN, clearly the same creature as the monster Leviathan in the Hebrew Bible and later literature. In the restoration period or later, the apocalyptic section of the book of Isaiah (chs. 24-27) refers to the same myth–in almost the same words, but the battle is projected into the eschatological Endzeit and has Yahweh as the protagonist (Isa 27:1). This eschatological form of the tradition is developed further in Revelation, first by the replacement of Yahweh by Michael, and second by the use of the more generic term “dragon” (DRA/KWN) instead of the name Leviathan. 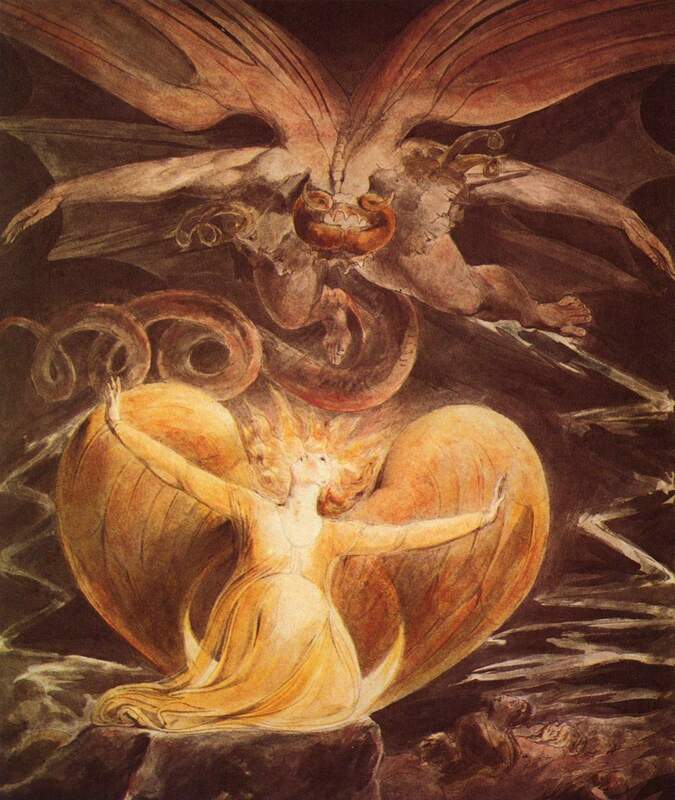 As Richard Bauckham has noted, the picture of the dragon is significantly developed by its identification (perhaps by way of Isa 27:1) with the serpent of Genesis 3 and then, by extension, with the devil or Satan. 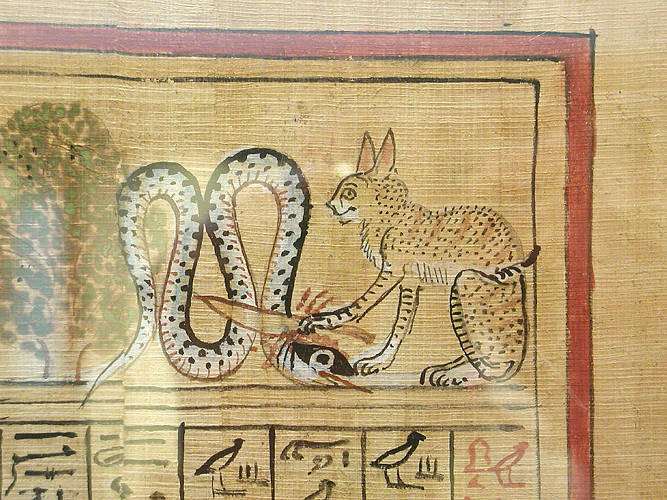 This Satan dragon serpent archetype can actually be traced back to the Egyptian “Lord of Chaos” Apep, who is depicted as a serpent, the embodiment of chaos and the enemy of the light and order of Ra, Ma’at and Thoth. Thoth or Tautus was nothing more then the title of an educated linguist and secret society member, who claimed himself to be the embodiment of the Egyptian Logos. Ra, as well as Horus, are also portrayed as often struggling against the darkness and chaos of this serpent, much like how Michael struggles against the Serpent and Dragon, Satan. One can see how this chaos myth repeats itself over and over again, traced back to the Egyptian religion which precedes Christianity and Judaism by thousands of years! …Egypt is sometimes understood, in His sense, the whole world as being marked out by superstition and a curse. By a similar usage Babylon also in our (St.) John is a figure of the city of Rome, as being like (Babylon) great and proud in royal power, and warring down the saints of God. Now it was in accordance with this style that He called the magi by the name of Samaritans, because (as we have said) they had practised idolatry as did the Samaritans. Moreover, by the phrase before or against the king of Assyria, understand against Herod against whom the magi then opposed themselves, when they refrained from carrying him back word concerning Christ, whom he was seeking to destroy. Eusebius quotes from a work by Dionysus of Alexandria, bishop of Alexandria, saying that there were many who rejected the Johannine (John) authorship and authority of Revelation, and actually hated the book in Church History (7.25.1-2). Some indeed of those before our time rejected and altogether impugned the book, examining it chapter by chapter and declaring it to be unintelligible and illogical, and its title false. For they say that it is not John’s, no, nor yet an apocalypse (i.e., an unveiling), since it is veiled by its heavy, thick curtain of its unintelligibility, and that the author of the book was not only not one of the apostles, nor even one of the saints or those belonging to the Church, but Cerinthus, the same who created the sect called ‘Cerinthian’ after him, since he desired to affix to his own forgery a name worthy of credit. It is worth noting that, according to the good bishop, Dionysius (yes, there were many bishops named after the Greek god of wine), a certain heretic Cerinthus believed in an earthly kingdom of Christ was filled with material pleasures including fornication and great marriage feasts. Here we have only scratched the surface with all the inner workings of Revelation and I suspect there is much more hidden and coded Gnostic parallels and Gemetria (the Assyrian art of assigning numerical values to words) contained in this seemingly “illogical, unintelligible and false” text, like in the city of New Jerusalem that shows up at the end of the apocalypse, which has strong alchemical and Hermetic traits. Gemetria is something I’ve been toying with for a while now and I may pursue it further in my research. Oh, this is very good work! I need to reread it quite a few times though. The information is dense, admittedly. But that’s the nature of Revelation and the information that follows after it is much like it in its density. No problemo! I like it dense! Wow! Thank you for your comment. I was only theorizing with the connections with Aztec and Native American legends but you bring up a lot more relevant points. There’s so much material to digest, you brought up there. The Mark of the Beast is the Hebrew transliteration of Nero Caesar that calculates, of course, to 666. In occult systems like Thelema, 666 is a magical solar number of the Beast and the Age of Aquarius (the Aeon of Horus for them) that we entered in now. parallelism in between Revelations 12 and the Pistis Sophia (Gnostic Bible) about Maria the Mother of all creation. In the gnostic masterpiece book of “PISTIS SOPHIA”. Sophia sing a song as a gratitude because Christ is coming to save her, and take her higher than the thirteen aeon, where obstinate (Name that the Ego receive in this book) can’t reach her no more. 1. I sing a song: trough your command, you take me to the most higher aeon that is up there, and you take me also to the lower regions that are in there. 2. And again trough your command, you save me of the inferior regions and put trough you the matter-light, and I see in it. 3. And you dissipate far away from me the emanations of obstinate (Name that the Ego receive in this master piece), that was constrained me and was hostiles (unfriendly), and you give me power, so I can be free of Adamas emanations bindings. 4. And you kill with your own hands the seven heads basilisk, and put me over hi’s matter. You destroy it so his seed do not reborn further ahead. 5. And you being with me, give in me power in all this, and you light surrounding me by all sides, and trough you, turn without power all the emanations of obstinate. 6. Because you take from them the power of his light and clear my road to lead me out of chaos. 7. And take me out of the dark matters, take back from them my powers, to the one’s they all ready take that light away. 8. You put on them purified light, and light in all my members where it wasn’t, you put back purified light from above high. 9. And you clear the road for them (my members) and the light of your face turn back indestructible in my life. 10. You conduct me above the chaos, chaos region, region of chaos and extermination, so all the matters that are in that region, will be liberated and all my power renovated in your light, and that your light could be in everyone. The seven-headed basilisk is the ego with its seven deadly sins that incessantly multiply inside of us. Into the abyss we have abominable elements, monsters of hell that have to be killed by our own intimate Christ. We, with the help of our intimate Christ, we must take away the light of the darkness. This is how we can draw from these abominations the light that they have stolen from us (consciousness). When our infernal aggregates that are being created by our mistakes are dead, the light and the divine powers will return to the initiated. The powers of the Initiated are renewed in the light of the intimate Christ. My favorite post I think. I love how you tied Icarus and Daedalus with the king of Babylon and Lucifer. I definitely see the possibility that the Bible is just a Hebrew rendition of Greek myth even more when I study this. When put together with what I have said about Livy, I think it strengthens my case. I may have to cite you in my research Alex. You do realize all these texts are just encoding knowledge of music, science, physics, evolution, and medical knowledge right? Yea there is a spiritual element and yes that is a literal reality behind the reality. But, you can apply all this physically too. Hell is in the stomach, a purifying fire. The 4 lights can be the elements or they can be red, black, white, and yellow/gold- the humors. Alchemy sees them as elements when applied to the world and the physician sees them as humors when applied to the body. The seven deadly sins weren’t invented in that time period but they could have based them on what they read. There are heavy uses of 3,4,7,9,12,13, etc. in texts. (and 30, 32). These texts are allegory and parable for universal truths. In parables you will find an alchemical story, a wisdom saying, a dietary prescription, a physics concept, etc. As above so below, brah! I have read the identities of the woman in Revelation 12 from different views, this is the only answer this is reasonable.